Ryal Harris emerged victorious in the Saturday V8 Ute race at the Townsville 400, leading all the way from pole position to the chequered flag. Harris was never seriously challenged on his way to the win, his second at Townsville and first at the Reid Park circuit since 2011. However, there was action and entertainment aplenty behind the Bushranger Ford FG Falcon driver. 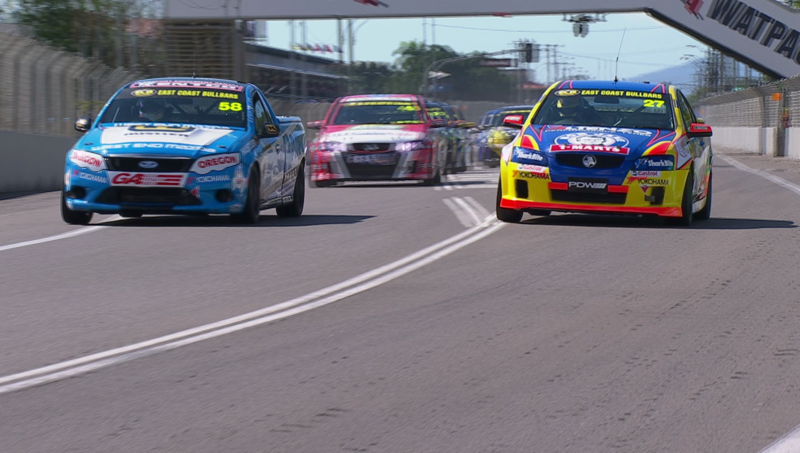 Kim Jane finished second ahead of Craig Dontas, the two Holden drivers engaging in a race-long contest. “I didn’t have the speed to keep up with Ryal – the 50kg weight handicap made it difficult – but I had a good fun battle with Craig,” Kim said. “I saved my car in the early part of the race, planning to attack Kim towards the end, but I left my run a bit too late,” Dontas added. Craig Woods finished fourth ahead of Michael Sieders, while Marcus Zukanovic finished sixth after starting at the rear of the field. The “Z-Man” had qualified second, but was excluded from the session due to a camber irregularity, and had to fight his way through the pack. “It was a shame to start at the back of the pack but we had the speed to work our way forward,” Zukanovic said. Also engaging in ferocious combat were New Zealand drivers Peter Ward and Matt Spratt – they swapped paint on a number of occasions, the battle ending when Ward spun at turn 11 and fell to 11th. Taking advantage to move up to 10th position was Richard Mork, the veteran enjoying a solid race despite a slipping clutch. Race 2 tomorrow will feature a partial reverse-grid format, with grid positions for Race 3 determined by points from the first two races.